This is a very unique whisky, of which I'm not sure everyone will appreciate it as much as I do. I guess you'll have to find out for yourself. I think this is expertly blended, high-end liquid. Interesting notes of rye bread and a damp dunnage warehouse, as well as cocoa powder, cappuccino, apricots and marasquin cherries. 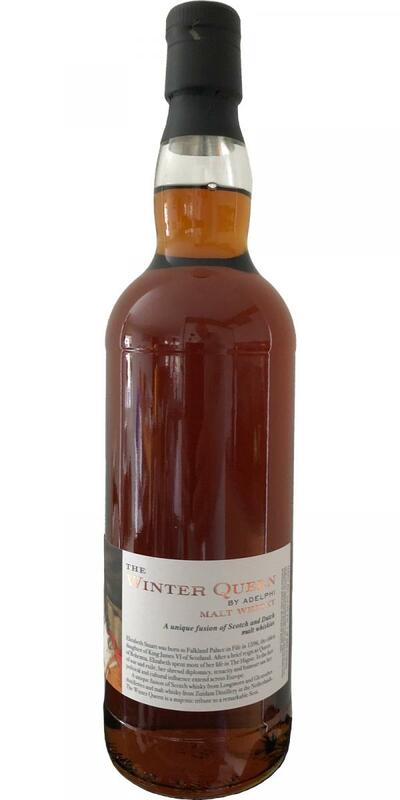 The spices work really well with the sweeter layers of this dram. The interplay between the spices and the sweeter flavours here work really well, again. This is surprisingly reminiscent of the Zuidam 100 Rye whisky. Not as rye-esque of course, but certainly shows similarities. Lots of spices. Think nutmeg, cloves and black pepper. There's dark notes of chocolate too, accompanied by cherries and apricot jam. All of the above. Long. 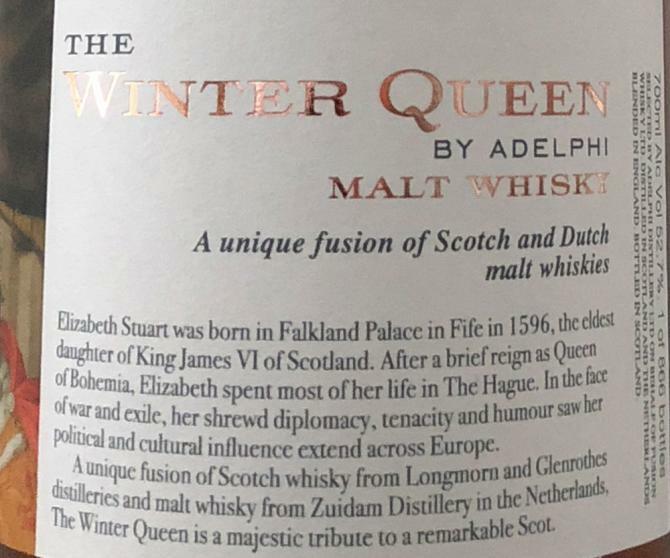 A blend of single malt from Glenrothes and Longmorn distilleries in Speyside and a single malt from Zuidam Distillery in the Netherlands, this whisky is named for Elizabeth Stuart, the daughter of King James VI of Scotland and Queen Anne of Denmark. She was queen of Bohemia for a brief period before spending most of her life in exile in The Hague. Fusion Whisky blends single malt scotch with single malt whiskies from around the world. Its first release, The Glover, combined Longmorn and Glen Garioch with Hanyu single malt from Japan, while its second release, The E&K, was a blend of Ardmore and Glenrothes and single malt from Amrut Distillery in India. Alex Bruce, managing director and master blender for independent bottler Adelphi, blends Fusion Whisky’s different offerings. 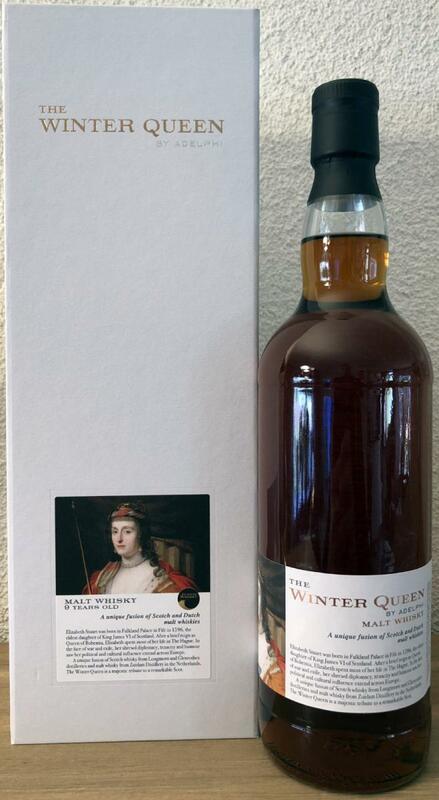 Unfortunately, these whiskies are not for sale in the U.S.
Raisins, freshly ground hazelnuts, sweet chestnuts. Some fir honey, pine needles and tree resin. A touch of solvent. Behind it plums with vanilla and some powdered sugar. Dried apricots, raspberry cake, walnuts. Marzipan with dark chocolate. Some glue. Earl Gray tea with candy sugar. A coming-together of three good casks. 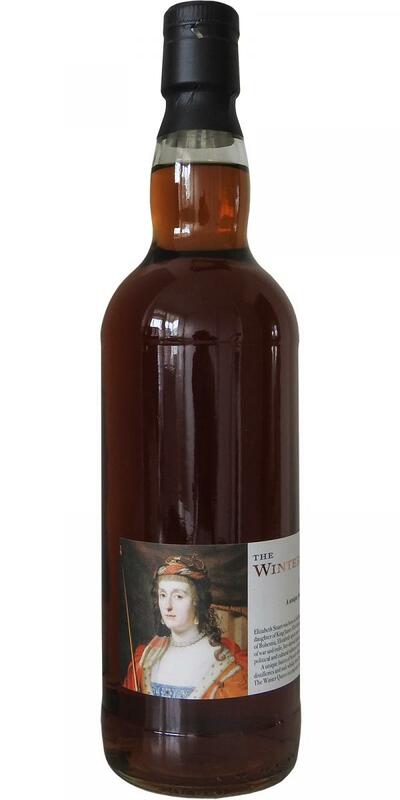 The nose comes slightly one-sided with the sherry cask doing much of the talking. The palate, on the other side, shows more of its complexity.